Imagine a small village in rural Africa, people working on their fields and living in self-built huts made from clay and limestone. I was living in such a community when volunteering for a local afforestation project near Mount Kenya for a couple of weeks. It caught me by surprise that every single person living in the village had a cell phone. Still, the options to charge their phones were rather limited. That is exactly where ‘Solarkiosk’ provides solutions. This situation might be typical for Africa. While it takes time and effort for certain technologies to enter African markets, the opposite is true for mobile phones. The use of mobile phones spread over the African continent at a breathtaking pace, already connecting an estimated 70-80 percent of the population to the world of telecommunication. On the contrary, around 70% of the Sub-Saharan African population currently lacks access to the electricity grid. Therefore, off-grid and mini-grid solutions are of utmost importance in providing energy access. Could respective investments pay off? The UN Sustainable Energy for All initiative estimates that the General Assembly’s ‘Energy Access for All’ objective of universal access to modern energy by 2030 will require an annual investment of 36-41 Billion USD. More than 60 percent of this this amount would be needed in Sub-Saharan Africa, where vast investment in energy infrastructure is required to keep pace with increasing energy demand, according to the Renewables 2013 Global Status Report by REN21. The promising message of this report is that Africa is now widely accepted as one of the world’s most promising renewable energy markets and increasingly attractive for investors. It is in this context that I would like to present the business model of Solarkiosk, an approach succeeding in providing sustainable energy to rural areas, creating jobs and addressing local demands. 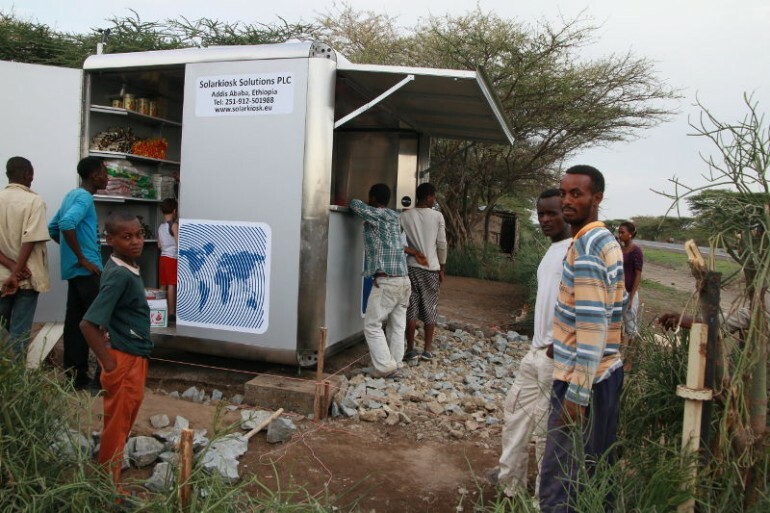 The first prototype of the SOLARKIOSK was built in November 2011, and commercial rollout started in Ethiopia and Kenya in 2012. Botswana is next in line. The Solarkiosk is actually a kit of parts, a modular system to be assembled upon arrival at its target location. Some parts of it are imported, whereas others are locally produced. Solar panels installed on top of the shop provide electricity. The shop itself provides energy, products, tools and services. It is a franchise company, giving the operator the chance to become an entrepreneur with limited risk, and offering jobs for up to four employees. It generates sustainable electricity, so that local people can charge their cell phones, car batteries, a computer and a solar fridge. Solar lighting is an additional achievement. By connecting several kiosks, it is even possible to create a mini-grid! So far, the Solarkiosk is a success story, and it seems as if Andreas Spieß and his team hit the mark. Ghana definitely should be your next destination and in partnership with Karla Solar Solutions provide solar solutions to remote off grid villages, schools, health centers, eating places (chop bars) restaurants and also to build special kiosk for rural Internet cafes. In partnership we can give the Ghanaian rural and semi-urban communities a new life and also help improve the quality of education and health delivery by providing them with energy. At Karla Solar Solutions, “We do not sell solar systems, we provide SOLAR SOLUTIONS to our clients.” That is the one reason why we think we are the company to partner SOLARKIOSK in business. Ghana welcomes you! Ghana is definitely the place solar kiosk has got to be due to this recent power outages.So solar kiosk can really needs you in this recent times. This is THE SOLUTION, growing a Kiosk into a real source of hope especially for the greatly blessed rural and urban Africa rich with natural sunshine. True Source of Energy for essential services including communication, data services, clinics, water purifiers, lighting for both security and studies in addition to longer shopping hours. I am fully for solarkiosk for all and SolarCell for SME to bring the rural closer to the modern city environment. I hope that goverments will not consider putting taxes on solarkioks to make them more meaningful and affortable for the intended market.